you should keep a few things in mind to make sure you get what you were expecting. Keep in mind places you are familiar with, where your crew will feel comfortable sailing. You also want to think about how long it will take to get to your chartering destination. We offer sleepovers, on the boat, the night before your charter to ensure that you are ready to go first thing the next day. Lots of charterers prefer this because they can take care of provisioning and getting to know the vessel they have chosen. The Charter Fleet Manager will give you a thorough check out in the AM. Maybe you are wanting to try out a bigger boat, or you are a sailor, but you don’t own your own boat. Chartering is a great way to set sail without actually making a purchase. You should keep in mind the size of your crew, how many the boat will sleep, how many heads are available, and what will fit into your budget. Here at Norton’s we have 4 beautifully equipped mono hulls ready to explore the Chesapeake Bay. We welcome all questions. You only know what you are really getting when you ask questions. Some Chartering companies may have outdated information, and you won’t know whether the A/C or TV that were listed are in proper working condition if you don’t ask. You won’t find any surprises here at Norton’s. Our boats are very well maintained because we want them to be in the condition we would expect if we were chartering them. If there are ever any questions, Lynn White, Norton’s Sailboat Charter Coordinator, is always here to answer them. Once you have chosen your boat and your location, you need to figure out your date. Here, September is prime chartering season for the Chesapeake Bay, but any time May – end of October is great! We are expecting a very busy and exciting Charter Season here at Norton Yachts. We hope that you will choose to be a part of the excitement with us! 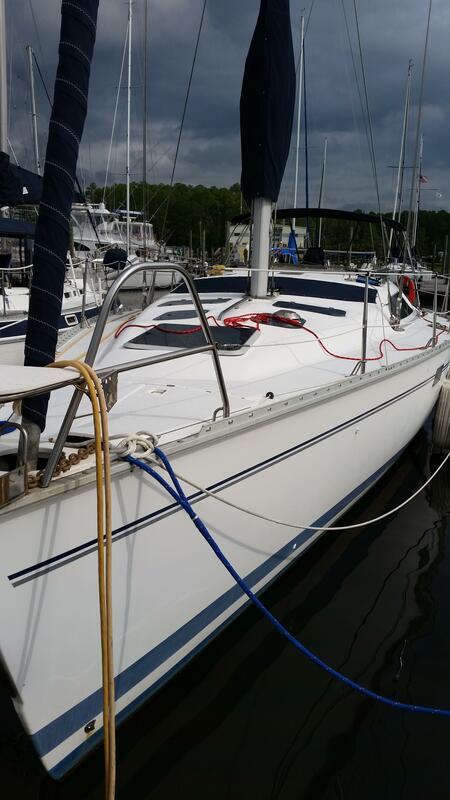 This entry was posted in Blog and tagged bareboat charter, charter, chartering company, chesapeake bay, Deltaville, provisoning, Sailing Charters, yachts. Bookmark the permalink. ← Norton’s Yacht Sales invites you to Deltaville Dealer Days for our Open House & Boat Show on May 3-4, 2014. "At Last" is an extremely comfortable cruising boat. She has a special blend of comfort, performance and short handed sailing capabilities all in one package. Two private staterooms, large salon and bright interior make the Hunter 40.5 a great family cruising boat. When you add ac/heat, generator, refrigeration, GPS chartplotter, water filtration and other items; you can cruise in great comfort.